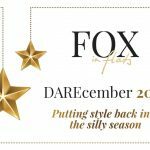 It’s the culmination of over three years of Style Dares on Fox in Flats where we’ve been challenging ourselves to step out of our style comfort-zones, haul ourselves out of our fashion ruts, shake off our day-to-day uniforms, and spice things up a little. The idea is simple: to experiment with hair, beauty and fashion and rock a different style every day for a month. December is such an exciting time of year, filled with loved ones and the tingly anticipation of The Big Day. And it’s also a month where it’s easy to get caught up in the silliness: the social engagements, the menu plans, the shopping, the wrapping, and OMG the diplomacy! Diplomatically navigating away from tipsy Simon from Accounts at the work Christmas party; diplomatically explaining to little ones why they may not get that elephant they really want for Christmas; and diplomatically navigating social obligations with our well-meaning relies. And so, more often than not, the focus is on everyone else, and there’s little time for ourselves. Try bracelets, cuffs and a wristwatch dancing together on your wrist, a pile of necklaces, or a bunch of rings. But however you do it, stack ’em high! Because your 10 year old niece is better at this than you, and that’s not cool. Go long, go big, go over the top! Spotted on the catwalk at Donna Karan, Prabal Gurung, Christian Siriano, Rag & Bone, and DKNY, it’s one of the hottest makeup trends of 2014. The kicker? It’ll whiten your teeth, and wake up your whole look. Try Revlon Orange Flip, MAC Morange, or if you’re really daring, Chanel Rouge Allure ‘Exentrique’. The easy way to get this right is by combining contrasting shades of denim – think light and dark. Tip: Darker shades down below are more slimming. Gold is a fast-track to glamour, so today play with golden eyeshadow or nailpolish, drape yourself with gilded accessories, make a statement with a gold sequin skirt or pants like mine in this post, or treat yourself to a pair of great sunnies like these. You don’t need to have sand between your toes to pull this off. Just think loose, fresh, and natural. Work it like a neutral and wear it with a snarl. Here’s some wild ways to work it into your look, and be inspired by these tiger mamas on the street. Chic, slimming, and a great camouflage for bumps, lumps and Vegemite stains. The antique brooch your Nana wore to your parents’ wedding. The Cure badge you bought at your first concert. That enamel pin you discovered in a thrift store. And the precious lady-bug brooch your mum gave you when you were five. Cluster in themes, and scatter liberally. His shirt, his jeans, or his tie. Steal it, work it (and if you love it, keep it!). Break out your brightest, most colourful outfit today and dance – because I’ll betcha it’ll make you happy! We’re talking the kinda heels you’d be willing to die for. Bang! Bang! Flashing a midriff? Too 80’s and also, after a certain age, just ‘no!’. But flashing a bit of back is an easy – and flattering – way to play peek-a-boo without making anyone blush or needing to to avert their eyes. Baby got back! Time to dust off that treasure from the antique store, that special something from your Grandma, or a pre-loved bargain. Add a zip of colour and originality to your outfit and get those digits dancin’! A stripe with a floral? A check with a spot? Get creative and create a fashion mash-up! ‘Tis the season for embracing your curves. Whether you’ve a shapely bottom, a bountiful bosom, or you’re lucky enough to have a baby bump, get ‘em out and flaunt it! Need a little help in that department? Fake it with your favourite push-up bra or shapewear and prepare to stop traffic. The sunglass shape du jour and a hot makeup trend this year. So bust out your black liquid eyeliner and get your kitty on. Averaging 5 hours sleep yet my skin looks younger. The short-cut to nonchalance, a couple of simple folds of fabric on a sleeve or pant can create a whole new silhouette. So get folding. Maybe it’s your hair, maybe your skirt-length, or even your socks for a geeky-chic look. Just get closer to heaven. Why should the tree get all the fun? Adorn yourself with your favourites – the bigger and shinier the better. 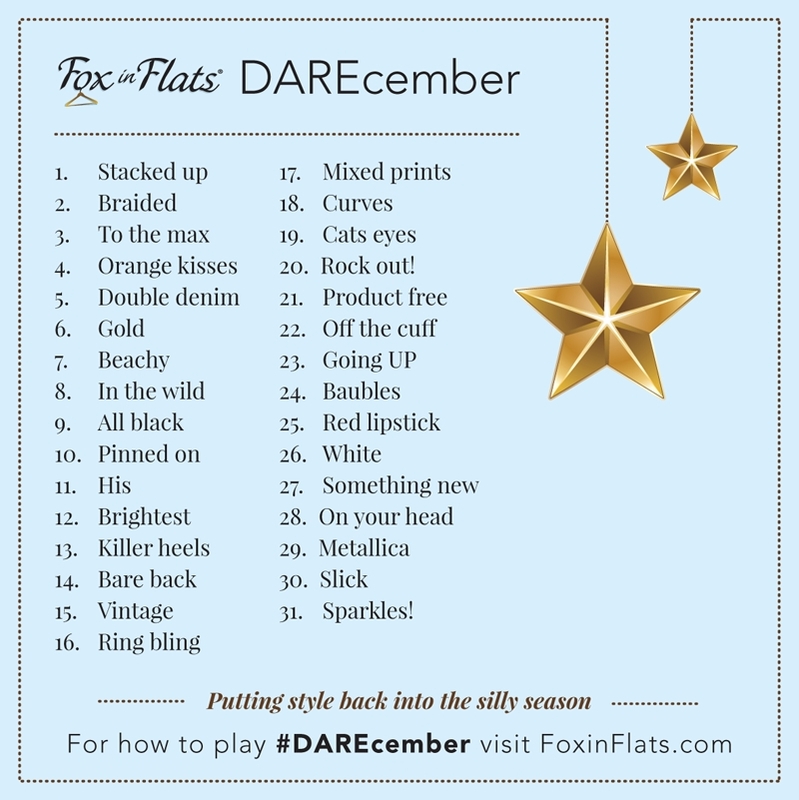 It’s Christmas Day, and a swipe of red lippy is a quick, easy way to add some Holiday cheer! If you were dreaming of a White Christmas and are feeling ripped off, here’s your chance to make amends. If you scored something fab for Christmas there’s no better time to work it. Or, try a completely new way to wear an old fave. Cowboy, beanie, baseball, fedora – pull it onto your noggin’ and wear with a grin. Gold, silver or bronze. Whichever you choose, it’ll be a winner. Slick and sleek is a fast way to look polished. So smooth it down, and get ready to slide into 2015. Get your glitter on and shake those sequins for New Year’s Eve! Drinking sparkly bubbly stuff is, of course, mandatory. Happy New Year! we love to see your styling handiwork! 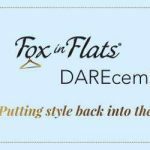 Seeing how everyone interprets the daily style challenges, and getting a peek into the day-to-day lives of women around the world, is a huge part of what makes the Fox in Flats Style Dares so fun. That’s why we’ll be sharing our daily faves around the interwebs for your sartorial enjoyment. Click here for some fun galleries created with photos other’s have shared while doing our Dares over the last three years. You’ll find that in doing this Style Dare and sharing your photos you’ll get so much more out if it than just style inspiration. See what one of our past participants said about her experience in this touching post: 10 things I’ve learnt from uploading selfies on Instagram. This prompt-list is custom-built for Instagram to share with your followers so they know why the heck you’re suddenly posting selfies every day this month. Here’s a button to pop on your sidebar to show you’re doing #DAREcember, and to encourage your readers to join in too. Simply right click to save and link it back to this post. 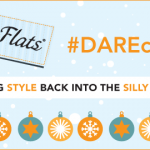 Here’s to putting style back into the silly season. Have fun and good luck!